Summer is just getting into full swing and with that it means more time spent outdoors, whether by the pool or out in nature. 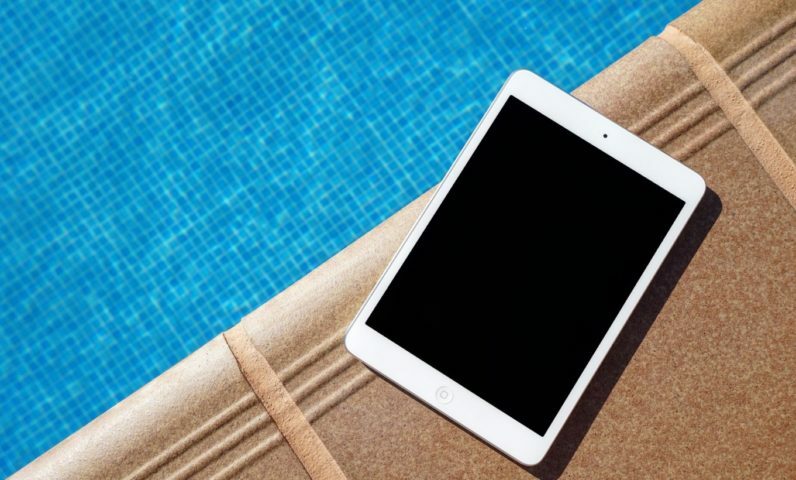 The beckoning of summer also means it’s time to start gathering the gadgets you’re going to need to make this summer as awesome as humanly possible. There’s a lot out there to choose from, but I’ve rounded up some of the ones I’ve personally used or looked at this year and put them together in a little listicle below. All of the products and gadgets listed below will be a great compliment to a family beach trip, camping adventure, or one of those random Tuesday afternoons getting sloshed by the pool with a couple friends. I’m only using this one as an example because I’m sitting here looking at one on my desk right now, but no summer gadget load out is going to be complete with some sort of external power station or bank, and this one has always done me solid. With the time you’re going to be spending away from outlets and guaranteed power, having a power bank can ensure that your electronics are staying charged wherever adventure (or the closest pool) takes you. This RAVPower unit can charge an iPhone 6 to full charge six times before the power bank has to be recharged. The power input on this model can see full charge times in as little as 12 hours, so while you do have access to electricity, you can get a charge on the power bank relatively quick. This one is not the smallest power bank on the market, but it definitely takes care of business. There are quite a few companies offering power banks, so it really is up to you on which one you go with, just make sure to have one. Alright, so this thing has so much going on with it. While I really hate to say this, it might in fact be the coolest cooler on the market. So, let’s dive in on these features. There’s a Bluetooth speaker, and while it’s not the best one out there, it plays music and has “Party Pairing” available which adds an additional wireless speaker to the mix to enhance the range and quality a bit. There’s also a blender, because nothing says “I’m ready for summer” like blended margaritas on demand. The unit features a 20V rechargeable battery with USB port that make the cooler act as a charging station. Also included in various pockets and places are reusable plates, a cutting board, LED lid light, and wine and bottle openers. You might have a hard time finding one right now, everywhere seems to be sold out, but look for local dealers if you can justify the price tag – you’ll definitely be able to brag about having the Swiss Army knife of coolers. So, the Coolest Cooler has a speaker in it, but what if you’re not looking to haul a cooler around or simply don’t want to spend the $400+ on the cooler? Then that’s where something like this Bluetooth speaker comes into the picture. I picked up the Voom 20 after using some of the company’s earbuds for awhile and while it isn’t the best speaker I’ve ever used, it is a really good pickup at the $50-60 price point; it definitely serves the purpose of a convenient unit when I’m on the road, on the trail, or passed out by a pool somewhere. It’s splash-proof, covered with a nice looking rubberized coating, and connects via Bluetooth or a 3.5 audio cable. It gets pretty loud and you should have no issues hearing it over a few people. It’s not going to entertain an entire party, but then again, it’s not meant to. Sound wise, it provided surprisingly full bass and a healthy mid range, but the highs were a bit disappointing – brighter highs would have helped separate it from the crowd of other similar offerings out there. Overall, still a solid purchase if you’re looking for a durable Bluetooth setup. Have you ever wanted to just straight up throw a speaker? Probably not, but that didn’t stop someone from making a line of speakers that you can literally toss around with your friends. Currently still in the Kickstarter phase, meaning, it was funded, but people are still waiting on delivery, the spherical speaker goes past just being splash-proof and actually is meant to be in the water. While people are still waiting for units and information on sound quality, there is something pretty novel and fun behind the idea slinging music at your friends. The unit also features the ability to take phone calls, but it really seems like overkill and I think 99% of the population would just rather do without if it meant a cheaper price and faster delivery. You might be able to get one in time for this year’s summer fun, but you’ll be ready for next year. A novelty to be sure, but a welcome one. If you plan on spending a lot of your summer around friends and making memories, this could be a unique way to accomplish that and preserve some special moments with friends and family. This little gadget is basically a self-contained printer that works with the iPhone 5s and any newer model. The Prynt Pocket and its accompanying app allows for editing and filtering in the app to ensure that printed photos are of pretty high quality, they’re not the greatest quality you’ve ever seen, but considering the size of the unit it’s pretty impressive. The size is definitely one of the more appealing factors of the unit and allows for you to take it anywhere your summer may lead. The app even has a feature that allows you to add a video inside of your photo that can be accessed through the app. What are some of your go-to essentials when it’s time to hit the beach or the trail? Tell me about them in the comments below!